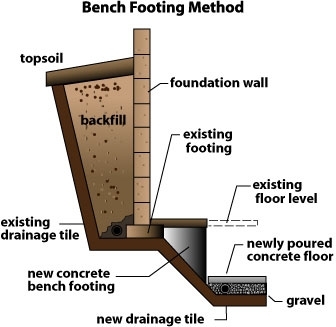 Bench-footing as a method of lowering basement. Pro and Con. Possibilities and limitations. If you think to use bench-footing way for lower your basement - read this article. Many older homes in Toronto, Mississauga and GTA do not have useful basements. In some cases, houses were built on the side of a hill, with just enough foundation to level the house. Other structures may have a “cellar”, but not a full basement. If you are a homeowner who has a less-than-full basement, what recourse do you have? Floor Benching. You MUST NOT dig down to the desired depth without first carefully evaluating the stability of your structure. Any excavation which extends below the bottom of the existing footers can result in damage to your foundation, or even to its collapse. In older homes, you may find that the footers extend only a short distance below the the original floor. It is unwise to dig deep enough to fully expose the footers, and any excavation beyond their depth almost guarantees problems. The most that a homeowner should do before consulting an expert is to dig a few SMALL test holes to determine the depth of the existing foundation. If your foundation is not deep enough, one of the least expensive and safest approaches to deepening the basement may be with “Bench Footings”. This involves stepping inward from the foundation walls, then digging to the desired depth, and constructing new footings which extend deeper than the depth of the new floor. The new walls extend upward to the original basement depth, and are topped with a concrete cap. The finished effect will be as if the house has a concrete bench extending along the foundation wall. This process protects the original footings from erosion / movement which are certain to occur if the soil supporting the foundation is removed. While bench footing is probably the quickest and least expensive way to deepen your basement, you should realize that the area of the basement floor will be reduced, and a full length bench along the wall limits your options for use of the space. Depending upon the soil on which the home rests, the depth of excavation, and your intended use of the basement, bench footing may not be a suitable solution. Since any changes to the foundation of your home risk permanent damage, basement deepening should not be attempted without consulting a reliable and well qualified contractor, such as AquaResist. Our skilled professionals will assist you in evaluating your structure and recommend the best way to deepen your basement. 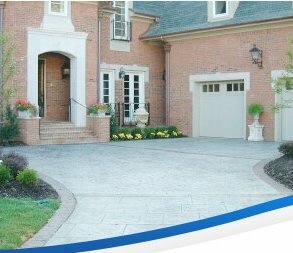 Call AquaResist 905-781-0672 for a free consultation and a written estimate. If we do the work, we'll give you a written warranty. We can help you to determine whether the best way to deepen your basement is with a Bench Footing.